….want to hear a bed time story sure to scare any vegan out of sleeping for at least a couple of weeks? I went to Mexico last week. Yup. Friand took me there for a family visit and I have to admit, I panicked a little about how I was going to find anything to eat in Mexico. Dining out in Mexico: what a scary prospect! Most important, I don’t speak Spanish. Sure, I can ask you where the bathroom is (not that I’ll understand your answer) so there is no way I could converse with a waiter or chef and clearly say “I am a vegan, no meat, no dairy in my meal.” I figured I was screwed. Thankfully Friand reassured me that he would take good care of me while we were out. And of course I trust him with every fiber of my being. So when the family wanted to go to Emiliano’s in beautiful Morelia, I wasn’t afraid. I basically just sat back & watched Friand work his magic. Upon arriving, it looked just like any rustic New England steak house: dark wood, open kitchen, salad bar. Those of you who have been to one of those places, know exactly what I’m talking about. My guess is that this place was attempting to either be Italian or maybe American, I’m not sure. But it didn’t matter! The waiter took one look at me and decided I needed the English menu. The funny thing is, that after 6 days of being in Mexico, seeing & hearing nothing but Spanish, I didn’t realize at first that I was reading an English menu! Believe me, I was beyond thankful for this. There were 2 options on the menu for vegetarians, one was printed: Vegetarian Pizza, and the second was something that would require some Spanish speaking skills and a little creativity. In a restaurant like this, there’s always the option of building a meal from already existing items on the menu. I’ve done it before, most chefs will do it, although it is more fun to challenge a chef to make something off menu. Here, I was contemplating asking for pasta with the grilled vegetables from the side-dish options. Friand, probably rightly so, discouraged me from taking that chance. Before the meal, we were served an assortment of tappas — pickled vegetables, chili covered crackers, sesame bread sticks, some sort of mushroom goo to eat with mini-flour tortillas, bread & sauces. For the table, we ordered the “Fried Parsley” as an appetizer without the bacon… Can you say HEAVEN?? I was in danger of filling up even before ordering my dinner! The Vegetarian Pizza of course includes cheese; this is what Friand ordered for me sans cheese. He was very clear with the waiter about my needs, and yes, when it arrived the pizza was exactly as I’d hoped. It was chock full of tomatoes, olives, artichokes, eggplant, red & green peppers and onions, super thin & crispy crust, served on a really cool wooden plate. It wasn’t the most exciting pizza I’ve ever eaten, but after a week of Mexican food, this little taste of *my* heritage was welcome. Being Italian, I don’t go more than a couple days without eating tomatoes or bread or basil or olive oil. My body & soul needed this meal like an addict needs their drugs. I give Emiliano’s 4 sprouts for having served me exactly what I asked for, though just like many American restaurants they only have 1 vegetarian option on the menu. 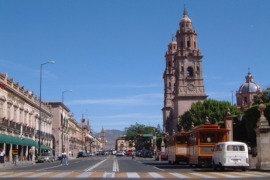 But good try, Emiliano’s!, and when in Mexico, take a side trip to Morelia and enjoy the colonial sites. Way cool!! The best I can do for a website or contact info is to direct you to Trip Advisor.